Keller Technology’s roots go back five generations. Expanding in size and capability every year, they were experiencing growing pains and had to move to a much larger facility. Panel Built helped them do it the most efficient and cost-effective manner possible. Challenge: Keller Technology outgrew their current plant and wanted to use their existing Panel Built mezzanines in their new facility. Solution: Panel Built met with key personnel at Keller to help determine the space needs in their new plant. 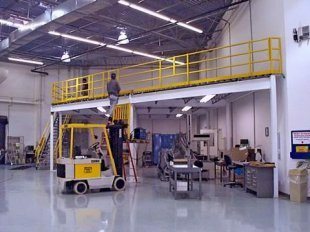 These needs along with available materials from the existing mezzanines were taken into consideration as Panel Built designed a space solution for Keller’s new facility. Panel Built Delivers: Panel Built redesigned a mezzanine for Keller’s new location utilizing parts from the initial mezzanine projects along with some new materials. The new mezzanine was a completely different configuration with a substantial increase in size. Project Specs: 135 x 50 “L” shaped mezzanine, created by combining 3 existing PBI mezzanines relocated from the old facility with 2 new PBI mezzanines. OSHA stairs and handrail, 125 psf, 22 gauge steel deck sub-surface with 1/8” steel diamond plate decking.